Let’s start with the guys. We tend to think it is easy for men to get ready – just shave, throw on a nice shirt, and you’re ready to go. But if we’ve learned anything from Tribble Reese, star of CMT’s television series “Sweet Home Alabama”, recently named one of Cosmopolitan Magazine’s 50 Hot Bachelors, and long time client of Bob Steele, looking your best is the result of attention to detail and a clear view of your personal style. Tribble hosted the salon’s first Modern Man event and fashion show, where the guests were invited to indulge in a neck trim, scalp massage, or a Redken for Men Color Camo hair color service. Most important, the gentlemen in attendance were able to learn about the latest styles in a comfortable, relaxed environment. From Bob Steele's first Modern Man: Gavin Stewart, Nick Simonette, Kirk Halpern, Ted Jenkin, Amanda Hair, Trevor Garner, Tommy Tillman, Larry Hart, Chris Burns and Tribble Reese. To get ready for the holidays, take a note from the Modern Man event and Tribble Reese. If you don’t have time to get a fresh haircut before your big event, stop by your salon to get a neck trim (most salons offer this as a complimentary service between appointments). It will clean up your look and costs you nothing! If you are ready to change your everyday style, channel John Hamm and go for a Mad Men-inspired look. To make the look more modern, use a matte finish product, part your hair to the side, and comb away from your face. A great product to use for this refined look is Redken Work Hard Molding Paste. For women, a great day to night look is the classic ponytail – it’s always easy to create and is, conveniently, back in style. To create a modern ponytail, Ashley uses a texture spray on the roots, like Redken’s Wool Shake, before pulling the hair up. Work the product into the roots, using your fingers to pull your hair up to get a little texture to the look. Leave the front part of your hair out once the rest is secured with rubber band and use your fingers to loosen the top of your hair. Tuck the front pieces your behind ears or pin back. Ashley also likes to take a little of the hair from the back of pony and wrap it around the rubber band, securing it with a bobby pin. You can add a headband to this style to give it a little more pop. To finish off your ‘do, add a little texture spray to the hair in the ponytail and separate pieces. 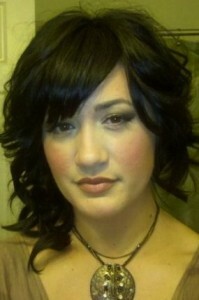 Ashley from Bob Steele Salon has perfected her curls this holiday season. For the evening, a Veronica Lake-inspired look is a perennial classic. First, part your hair beyond your natural part to give the look some drama. Curl your hair with a medium barrel curling iron, making sure all the curls go toward your face. The trick to getting those flawless curls? Once you use your curling iron, don’t touch your hair and let it cool in the curl. After all the hair is cooled, spray with a workable hairspray like Pureology’s Strengthening Control Zero Dulling hairspray. Use a natural bristle brush to softly comb all the hair, letting all the curls connect and create waves. Finish with more hairspray. On the opposite side of part, tuck your hair behind your ear or add a holiday-worthy clip to give the look more balance. The holidays can be stressful, over-scheduled, and tiring, so make sure you are comfortable with the looks you choose and make them your own.